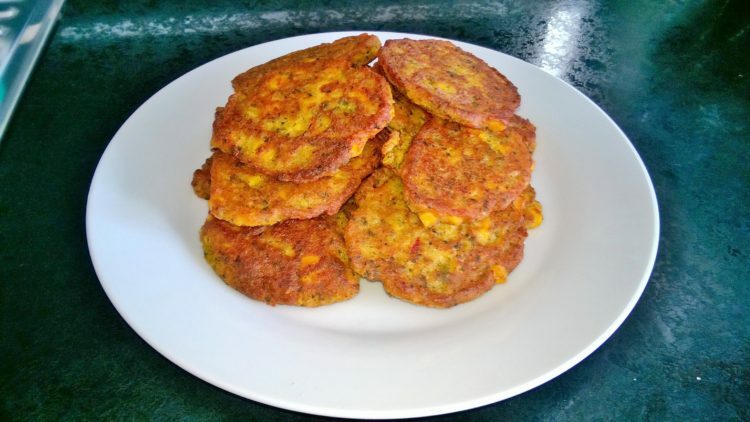 1 Place 340g tin of sweetcorn, self-rising flour and the gram flour mixed with water, add the spring onions, dried coriander leaves, smoked paprika, rock salt and cracked black pepper in a food processor and wiz until it becomes a thick batter. 2 Then pour the thick batter into a bowl and mix in the 198g tin sweet corn with peppers. 3 Heat a frying pan on a medium heat and add the coconut oil. When the oil has heated using a serving spoon, spoon the batter into the frying pan in small/medium circles. Don’t over load the frying pan do about 3-4 at a time. 4 When they are golden in colour, and cooked though, remove from the frying pan and place on a plate covered in kitchen paper to soak up any excess oil. 5 Repeat the process adding more oil when needed, until the batter is finished.